Thanks in part to the <Prism> cards, the Lost Zone has “returned” to the game once more, though it appeared to only be for this one mechanic. Then they made something to work with it more. 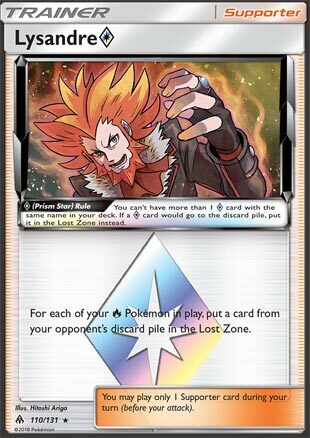 Lysandre <Prism> is a Supporter card that simply says for each Fire Pokemon you’ve got in play, you can put a card in your opponent’s discard pile right into the Lost Zone. Effectively that removes the card from the game, as there are no means in Standard of bringing cards back from the Lost Zone. This is probably one of those cards that you could look at and go, “You know that doesn’t seem that useful. How does putting my opponent’s cards in the Lost Zone help my Fire deck?” And that’s honestly fair to make that statement. After all, Fire Pokemon don’t classically have anything to do with removing your opponent’s cards from play (they never did, but even in the days of the Lost Zone, there weren’t many Fire Pokemon that actually interacted with the zone), and these days there aren’t that many Fire decks to go around save for Volcanion, which is on the verge of heading out. But consider this: how many times has your opponent been able to cycle cards back from the discard pile? How many Items were reused? How many Energy did they discard only to get right back? And then consider how effective it would be to completely nullify that advantage by removing those cards from the game? And consider that you could be removing as many as 6 of these cards? It’s something that gives Lysandre <Prism> a lot of strength, and I wouldn’t be surprised to see it appearing in any deck with Fire Pokemon in it in order to capitalize on its strength. It’s great to use against a lot of general strategies, and it’s got a major advantage on discard-centric strategies. So even in a time frame where such strategies aren’t as prevalent, Lysandre <Prism> can still prove to be immensely useful against many of the mainstream decks just for getting rid of cards that could keep coming back! Keep it in mind, as it might be a sleeper hit till the next big Fire deck comes around. Arora Notealus: Isn’t it a bit ironic that Lysandre <Prism> gets rid of cards, but then it also goes into the Lost Zone itself? It’s almost like he’s just dragging all the cards with him into the Lost Zone. Which could make sense, he does kind of disappear after the events of XY. And no, the Rainbow Rocket saga doesn’t count. Next Time: Coming from another dimension, they’re here to help! Today, we’re looking at Lysandre Prism Star! Not to be confused with the regular Lysandre card (XY Flashfire, XY Ancient Origins), but this one has an unique effect worthy of being a Prism Star card. As usual, you’ve got to deal with being both a Prism Star card and a Supporter card to get used to its restrictions. So, what does he do? This………is actually potent! Granted, to make the most out of this once per game Supporter card, you have to have a full team of Fire Pokemon in play to gain the maximum effect. In this case, having six Fire Pokemon in play would mean SIX cards from your opponent’s discard pile outside of the game! The best part is that you get to choose which cards you wanted out. Expanded has Sky Field, which increases Bench size to eight, so with the Active Fire Pokemon and eight Benched Fire Pokemon, that’s NINE cards you get to choose. One would wonder what kind of deck that would have mono-fire type deck without putting Tapu Lele-GX on the bench? Straight away, there’s Volcanion-EX and Volcanion from XY Steam Siege as these two basically just formed itself in a deck. There is also Flareon from XY Ancient Origins that makes Stage 1 Pokemon become Fire types in addition to existing types. That could easily make Stage 1 decks become the type needed for Lysandre Prism Star to achieve the maximum effect. Besides that, I can’t think of other fire decks. Not to say that Lysandre Prism Star is useless, as even one card in the Lost Zone can throw your opponent off guard if they actually rely on it. It’s mostly the range is limited when it comes to making a minimum or maximum impact, and so far, two of these decks that I’ve mentioned would love having this card on their arsenal. In Limited, the only reason not to run this is if there’s not enough Fire Pokemon to be worth using, and discarding cards in Limited are few and far between. Conclusion: Lysandre Prism Star is specialized due to needing a certain type, but I believe that the effect is worth the hassle that Fire decks would love to take advantage of after your opponent overextended their resources. Nothing gets back cards from the Lost Zone, so if you carefully choose the cards, your opponent has little or nothing to do. This already makes Stage 2 decks difficult to cope, as it requires many evolving stages to reach the final stage, and taking out the ones below it renders it dead cards for the rest of them. Lysandre Prism Star (FLI 110), from the Forbidden Light expansion set, comes in as the second Supporter Prism Star card. This card allows you to move a number of cards equal to the amount of Fire Pokemon you have in play from your opponent’s discard pile into his Lost Zone. So you have to know that while this card doesn’t do much for Standard right now, there could come a day when it sees some use. I mean, we have to know that the Ultra Beast with an attack equivalent to Night March is going to drop into the meta at some point in the future. I don’t know when, but you have to assume that we will eventually see an Ultra Beast with an attack that does damage equal to some multiple of Ultra Beasts in the discard pile. When that happens, Lysandre Prism Star will see significant usage… in Fire decks. Other than that, it’s hard to imagine a scenario where it sees use outside of that counter future Ultra Beast Night March deck. It has potential, and it feels like one of those cards to keep in mind over the next couple of years. This could be one of those cards that we kind of forget about but then re-discover… a year or two down the line. Right now, its scope is far too limited and there’s not a whole lot of point in playing it in the Standard meta, but it could see more use at some point in the future.